As Sony Music issues an email to retailers calling Michael Jackson the ‘self-proclaimed King of Pop’ and referring to him as ‘Jacko’, The MJCast’s Jamon Bull explores the star’s troubled relationship with the label. In the summer of 2002, Michael Jackson put his career on the line. Taking the stage on July 9th, at the headquarters of Reverend Al Sharpton’s National Action Network in Harlem, New York, Jackson was the main speaker at an event titled “Equality for Blacks in the Music World”. Standing shoulder to shoulder with a host of musicians, producers and music executives, the King of Pop accused the record industry of racism and corruption, alleging a ‘conspiracy’ to create a systemic disadvantage for black artists signed to major record companies, including himself. His childhood heroes – game-changing artists whose innovations continued to inspire new generations – were never adequately compensated, he lamented. The July 9th event was the third time in less than a month that Jackson had excoriated the music industry in a public speech – and the media reaction to the previous two had been unkind. His latest album, Invincible, had sold just over five-million copies since its release eight months earlier – a colossal hit for any other artist, but below what Jackson, his label and the media had come to expect from the King of Pop. The project had been branded a ‘flop’ and a public war of words had broken out between the artist and the label. Sony claimed it had spent twenty-six million dollars on promotion but that Jackson had demanded unjustifiable sums for music videos and refused to travel or tour to boost sales. Jackson countered that Sony was lying about how much it had spent, saying he believed the label was deliberately sabotaging the project to ensure it made a loss, so executives could try to seize his fifty per cent share in the company’s music publishing catalogue as payment for the debt. Sony’s former vice president Cory Rooney would later say in an interview that Jackson had been correct all along. His trip to New York had come shortly after a visit to London, where he had demonstrated outside Sony’s UK headquarters with fans and, on June 15th, delivered a speech claiming the label was trying to sabotage him. “Michael’s going gangsta today!” one excited fan screamed. But he wasn’t done. On July 6th, he took to the stage at the National Action Network for the first time and ramped up the pressure on Sony, this time making a potentially industry-shaking claim – that the company’s CEO, Tommy Mottola, was a racist. The comments sent shockwaves throughout both the record industry and the media. One can’t underestimate just how bold an act this was for Jackson. He wasn’t just attacking one of the most important men in the recording industry, but as a board member of Sony Music and fifty per cent owner of its publishing empire, he was blowing the whistle on his own company, which he had helped to build. But what fans saw as Michael’s ’emancipation’ moment, the media appeared to consider as little more than an uppity black man playing the race card. The media scolded Jackson for daring to bite the hand that fed him. The Washington Post accused Jackson of ‘pulling the race card’ because his career was ‘sliding into the abyss’. It said ‘riled up’ Sony execs were briefing the media that Jackson was a ‘weirdo’ and a ‘pouty diva’. Mocking Jackson’s skin condition vitiligo, WPGC-FM radio DJ joked that Jackson’s next song should be, ‘Say It Loud, I’m Vanilla and I’m Proud’. Michael Miller, at Columbus Business First, branded Jackson ‘a flaky, spoiled has-been, more famous for his plastic surgery than his music’. 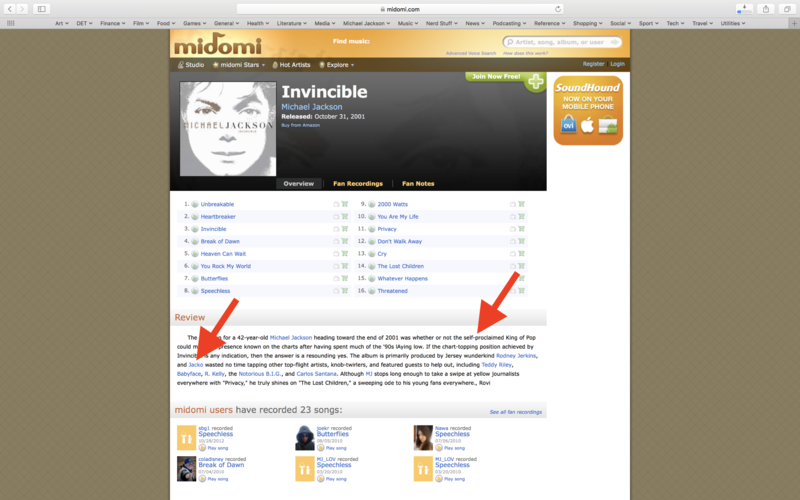 But the suggestion that Jackson’s gripe with Sony was rooted in poor sales of his album Invincible was disingenuous. The first sign of tensions between the two appeared in an interview Jackson conducted with a fan magazine, Black and White, in 1998. The star and his interviewer were discussing his 1997 album Blood on the Dancefloor, which – despite fairly recent allegations of child abuse – had broken a Guinness World Record to become the biggest selling remix album of all time. Jackson was even seen crying in the studio during recording sessions Mottola would visit. Music producer Bryan Loren recently sat down with The MJCast for a podcast interview and discussed how emotionally disturbed Jackson would become when Mottola showed up at the studio. In terms of knowing exactly what Michael stood for, the 2000’s was simply not a confusing for Michael Jackson fans. It was a trying time perhaps, seeing their hero so embattled, but not confusing. Jackson was actively protesting Sony. And so did his fans. They saw him bravely waving protest placards above an open top bus, wearing a bullet proof vest. It was a call to arms, and fans proudly defended their hero through boycotts. Many still do. In 2009, Jackson was tragically killed whilst rehearsing for his sold out London concert residency. Months after his homicide, the executors of his Estate sold him straight back to the very company he’d despised and spent the last seven years boycotting. Just over a year after his manslaughter, Sony released its first posthumous album – of remixes – to extreme criticism. Acting directly against the express wishes of his grieving relatives, studio collaborators and fans, Sony included three fake Michael Jackson songs, sung by a white vocal impersonator, on the album’s track-list. That incident remains the subject of ongoing litigation, in which Sony and Jackson’s Estate have conceded that the tracks are likely fake – but they continue to sell them. Now – eight years after the Cascio fiasco, and sixteen years after Jackson’s anti-Sony protests, the label continues to disrespect him. Roughly a week ago, on July 23rd, a listener of our podcast leaked us an email from a high level executive at Sony Music Australia. 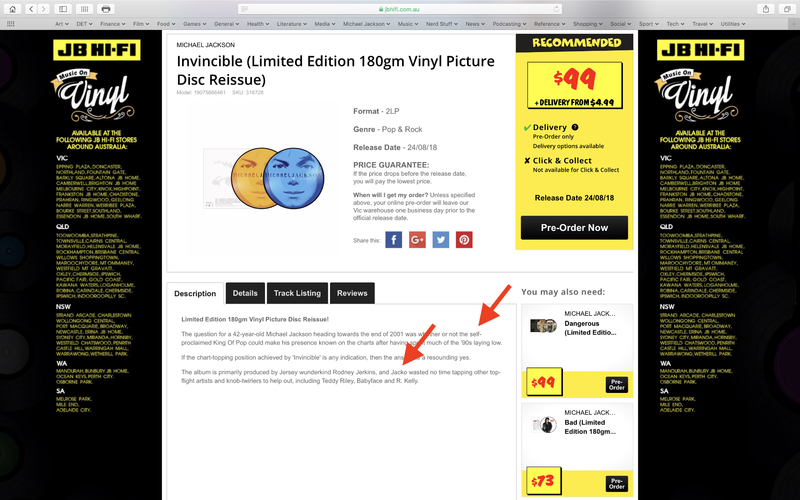 This email, titled “SURPRISE: PRE-ORDER SETUP :: MICHAEL JACKSON PICTURE DISC VINYL RELEASES” contains extensive information around track-lists and “blurbs for websites” that wish to promote this new product. This collection of picture discs is a box set being released by Sony and Jackson’s Estate in celebration of his ‘diamond anniversary’. For a casual observer not averse to poking fun at Jackson as some kind of societal punching bag, the terms ‘self-proclaimed King of Pop’ and ‘Jacko’ may not appear particularly inflammatory. But for educated Michael Jackson fans, the use of this language by a company supposed to be representing Jackson’s interests is beyond incompetence. This belittling description was disseminated in an email by one of Sony’s highest paid employees. Their identity is being protected at the request of the person who leaked us the material. The term ‘Jacko’ has long been a thorn in the side of Michael Jackson fans around the world. It was first used by British tabloid The Sun during the mid-to-late 80’s in the form of ‘Wacko Jacko’. This effort to paint Jackson as mentally ill and then mock him for it with a demeaning moniker stands in stark contrast to how the press have elevated white entertainment icons like Elvis and Bruce Springsteen, referring to them, respectively, as The King and The Boss. Using the term ‘Jacko’ wasn’t the first instance of The Sun publicly belittling a black luminary through attaching a derogatory title that calls into question their mental state. Following world boxing champion Frank Bruno’s retirement, and eventual mental health problems, the Sun ran a front page calling him ‘Bonkers Bruno’. The outcry was immediate, enormous and the paper had to change the front page for later editions and publicly apologise. Meanwhile, ‘Wacko Jacko’, also a slur on somebody for perceived mental health problems, continues to go totally unchallenged. Yet here we are in 2018, and his own record label is instructing music retailers to call Michael ‘Jacko’. 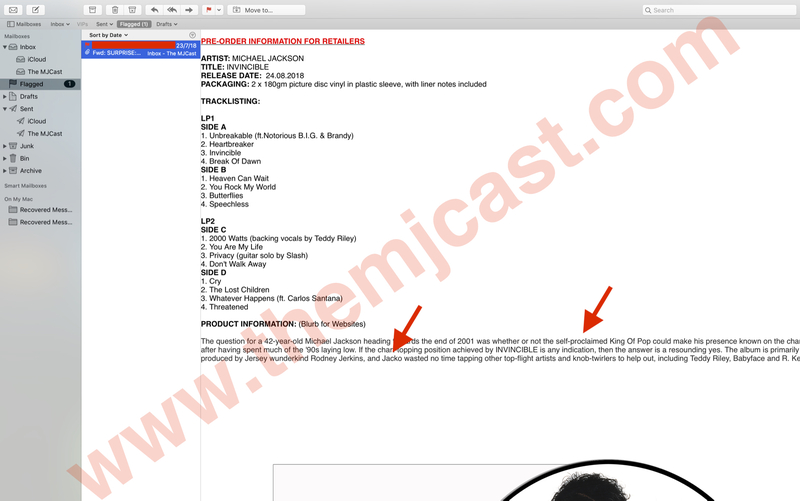 Sony’s instructional email also expressly tells retailers to call Michael Jackson the ‘self-proclaimed King of Pop’. Jackson himself refuted the allegation that he’d given himself this title, telling Oprah Winfrey in 1993: “I didn’t proclaim myself to be anything. I’m happy to be alive, I’m happy to be who I am. ‘King of Pop’ was first said by Elizabeth Taylor on one of the award shows.” In this instance, it’s likely that Jackson was actually wrong. The phrase ‘King of Pop’ was used to describe him as early as February 1985, by TV Guide. The frustration for Michael Jackson fans with Sony’s album blurbs will not end with the use of this denigrating language. They are also riddled with errors. They claim that Jackson was ‘laying low’ in the 1990’s and that HIStory album includes the theme of suicide. The label even gets his age wrong and lists Leave Me Alone as being on the Bad vinyl when it actually isn’t. 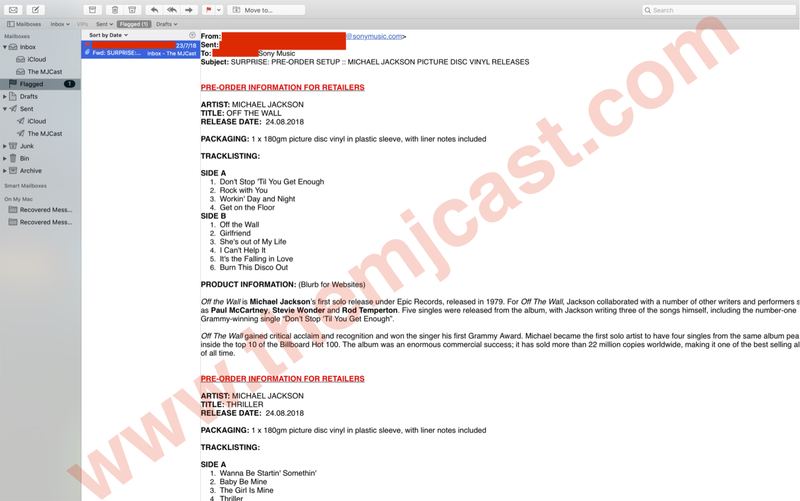 Upon spotting these errors, The MJCast contacted the Sony executive who sent them out. Correspondence lasted several days. He seemed more interested in finding out the source of the leak than actually fixing the problems. Of course, the problems weren’t fixed, as retailers like JB Hi-Fi and Sanity are still using Sony’s descriptions on their websites. In some handy investigative work, Richard Lecocq, co-author of ‘Michael Jackson: All the Songs – The Story Behind Every Track’, discovered that the text certainly didn’t originate from Sony, but was probably lifted from this website. This has to stop. Sony and the Estate’s ongoing disregard for Michael Jackson must stop. They continue to sell fake songs on the Michael album. They continue to produce factually incorrect and ludicrous social media posts on their official accounts, including accidentally tweeting photos of impersonators, tweeting fabricated images and praising magazines who used the word ‘Jacko’. They continue to ignore fans’ wishes. And now, they’re actively calling Jackson a belittling name that he detested, while instructing major retailers to do the same. Michael Jackson didn’t protest this company in 2002 for nothing. He did it so his fans could rally behind him in demanding they treat him and all other black artists with the dignity they deserve. To join us in expressing your frustration around this, email Sony Music Australia’s CEO at [removed] and tweet the company publicly at [removed] on Twitter. Demand that they contact music retailers and ask them to amend their advertisements to fix inaccuracies and remove the insulting names ‘Jacko’ and ‘self-proclaimed King of Pop’. He’s not a Jacko. He’s Jackson. Update (06/08/2018 5:50pm) – Gordon Pitt (General Manager of Sony Music Australia​, Legal & Business Affairs) has emailed The MJCast​ to apologise for errors in their marketing email and not correcting the language when I pointed it out to them. Sony has now contacted retailers who used the information to have it corrected. I can confirm that this is the case. 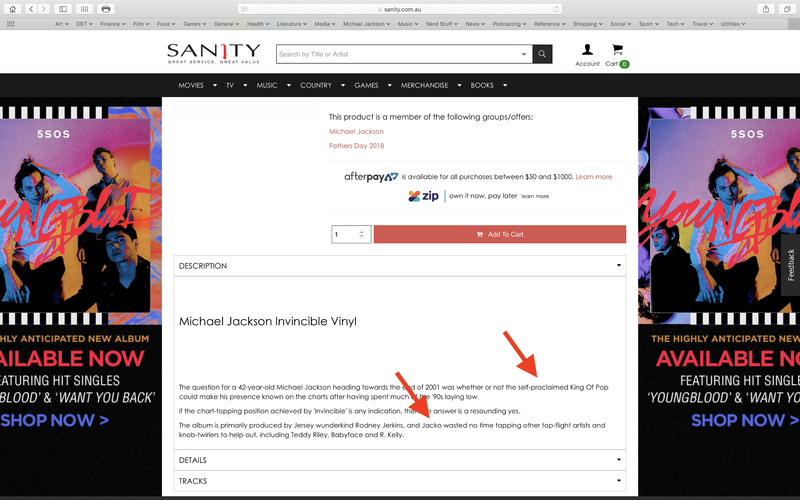 JB Hi-Fi and Sanity have both updated their Invincible vinyl re-issue listings to remove offensive descriptions of Michael Jackson and factual errors. Thanks everyone in the fan community who raised their voices as one to fix this. Gordon has given us permission to share the below email. This entry was posted in Op-eds, The MJCast, Uncategorised and tagged Cascio Case, Jacko, King Of Pop, Michael Jackson, Self-Proclaimed King of Pop, Sony, Sony Music, The Jacksons, Wacko Jacko by Jamon Bull (Admin). Bookmark the permalink. Thanks Jason, I have never sent an emailed so fast. Thank you Jamon, so good that the issue has been resolved, you guys are heroes!!! Please let people and Sony know that the King Of Pop title was known looong before any conspiracy anti-Jackson media had ever mocked and hated MJ with such “self-proclaimed” propaganda. “I saw your post in response to the SongFacts interview re-printed in Hypebot. You are abslutely right, and I referenced it wrong in the article. Michael’s management wished to perpetuate create a campaign for the title and that’s what we were concerned with at the time. The media was turning on Michael, and we thought pushing that titled could strength the media backlash. My comment in this article was too short-cut and not a clear version of the story or what I intended to present. Ultimately, what I had hoped to convey was that in the end, he was right, and that those of us who fretted over these issues with him, were ultimately over-protective. I always saw that our taking issue was ironic, as he took those risks and succeeded, which is what a legendary entertainer does. I hope that brings greater clarity to the issue. I have the deepest respect and appreciation for Michael’s talent and the enormously challenging life that he lived. I had the honor of working with Michael for several years. I thought the article was going to be one strictly about songwriting, so I perhaps let down my guard when it turned into so many questions about Michael. Unfortunately, anything that is said about MJ sadly seems to be a source of clickbait. I blame myself. his estate is left in the hands of people he despised.